The IOIO, a breakout board for Android phones that predates the Android Developer Kit hardware, is a now a little bit easier to upgrade. That’s because [Ytai’s] IOIO manager app just his the Android market. The PIC24F that sits proudly on top of the board has always been running a bootloader, but for security reasons it is programmed to only talk to apps that have been officially signed. Now that there’s an app that meets this qualification, you can upgrade the firmware from your phone without the need for an external programmer. What about the bootloader itself? Surely that will need upgrades over time, right? Well, yes. [Ytai’s] announcement today also came with an option for upgrading the bootloader but with one caveat. You’ll need two IOIO boards to complete the upgrade. One connects to the phone and becomes a programmer, while the other lays back and waits for a refreshing code flash. 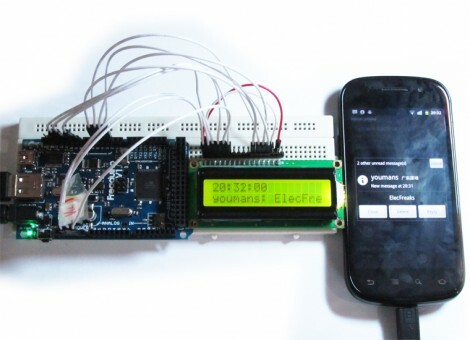 Here’s an Android accessory project that adds a secondary LCD display. It utilizes the Android Open Accessory Development Kit standard to connect the 16×2 character LCD as a USB device. It pairs an app on the phone which runs transparently with firmware for the ATmega2560-based Arduino compatible board you see to the left. The app launches as soon as the auxiliary hardware is connected and is responsible for determining which lines of text are pushed out to the LCD. The example code displays the current time on the top line, and scrolls incoming text messages as they are received. This is a good way to get your feet wet with the ADK hardware. We’ve already seen it used for larger displays like this LED marquee, but this smaller test project doesn’t require much hardware setup. Chances are you either already have an Arduino and character LCD on hand, or can easily borrow which makes this an easy weekend project. One note on that Arduino compatible board; it’s called a Freakduino ADK but we couldn’t figure out if it’s a Freak Labs product or not. If you have some insight about that, please leave a comment.